Wearables usually focus on impressive hardware, but what about clothing? With a combination of sensors and an operating system, the future is looking brighter. While most wearable technologies have been bits of hardware, such as watches, there are a growing number of tools that are built into clothing itself. For instance, sweat bands have been developed to monitor our dehydration levels based upon the sweat it collects as we exercise. LumoRun have developed a range of ‘smart clothing’ that monitor your fitness activity, with IBM also teaming up with Under Armor to do similar work. More advanced technologies aim to measure more than just your activity. For instance, one project aims to detect your fatigue levels for you, whilst a smart compression sleeve does everything from sleep monitoring to ECG provision. The latest project of this ilk is an EU-backed venture from a consortium of researchers from Germany, Switzerland, and Sweden. 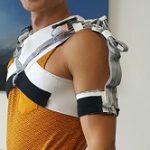 They’ve developed a network of sensors that can be easily embedded into fabrics to monitor a wide range of things, from activity levels to physiological changes. The output is a washable fabric complete with an array of sensors capable of detecting movement, activity, changes in body capacitance and electrical signals. Of course, whilst sporting goods remain the most likely home for the technology, the team are also experimenting with other fabrics. For instance, pillows may be able to monitor our sleeping posture. The aim is to delineate the production of the smart technology and thus make things affordable for the mass market. “Thus, instead of having to implement an expensive special purpose solution for every application, generic mass-producible components could be flexibly put together to create a variety of easily reconfigurable applications,” the team adds. Central to the technology is an abstraction layer, which you can think of as akin to an operating system for clothes. This allows for the development of apps for clothes without the developers needing to worry about fabric production or the various electronic aspects of making smart clothing. At the moment, this OS runs on Android. The project has already received considerable interest from industry, with companies such as Volkswagen interested n developing a smart car seat that monitors the posture of the driver. Sportswear giant Adidas have also been interested in a smart football boot that can detect the force with which we kick the ball. The belief is that over the coming decades, such smart functionality will be a feature of all clothing, and the breakthroughs made by projects such as this one will be an important part on that journey.